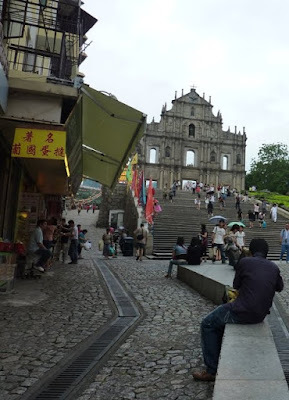 One of the pics I kept on the wall above my computer as I was writing Destination Saigon was of the ruins of St. Pauls in Macau. 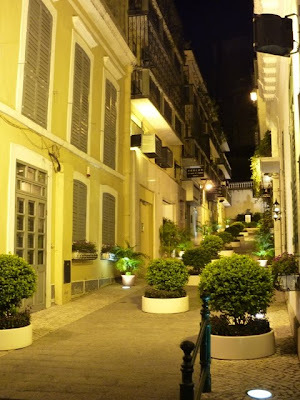 It might seem an unlikely inspiration when writing a book about Vietnam, but Macau is one of my favourite places in the world, and whenever I think about it I become excited, literary and ever-so-romantic. It is just one of those places. 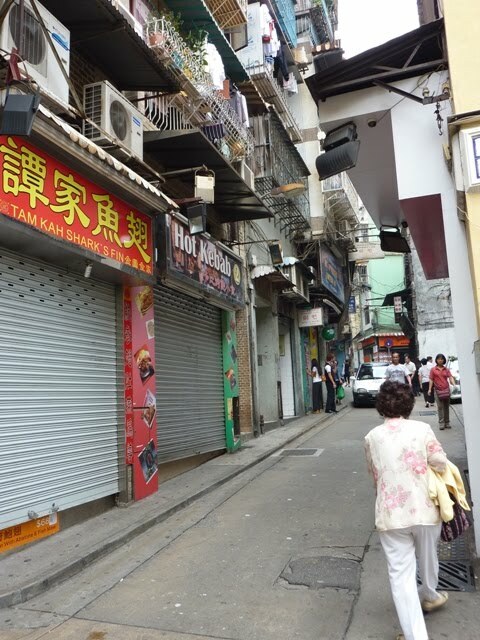 For centuries it's been a retreat for criminals, vagabonds, dissidents and every sort of neer-do-well. It has always played host to gangsters, pirates and every shade of underworld figure imaginable. It is, quite possibly, the most enchanting and fascinating island in the world, and I can never get enough of it. 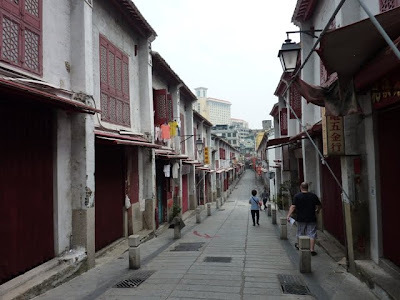 I really hope to write a book about Macau one day, and I certainly plan on spending more time there in the coming years. And no, I am not a gambler - I only ever set foot in the casinos to enjoy the outrageous buffets or admire the ultra-kitsch decors and architecture. But mostly I love the old Macau, the crowded, cobbled streets filled with churches, temples, restaurants and curio shops. Just walking down a Macau street makes me happy, and makes me thankful that I live in such an incredible world filled with so much diversity and mystery. 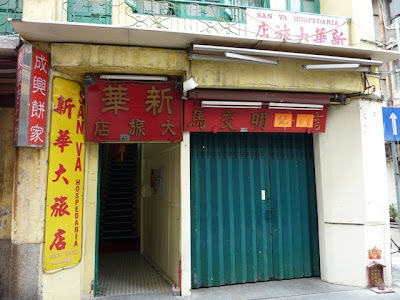 It may take me a few years, but some day soon I am going to hole myself up in a little Macau hostelry and write the definitive book on the island. Until then I will let my memories of the place inspire me in all of my creative efforts. Having learned of my obsession, as a young man, with Gabriele d'Annunzio, my best friend at the time - an especially literary type - asked me casually if I was also a fan of Baron Corvo. I confessed that I had never heard of him, and she said "Oh, but you must read The Quest for Corvo - you will love it!" And so began my love affair with the wonderfully eccentric Baron Corvo and his crazy writings. Of course, part of any love for Corvo normally rests with A. J. A. Symons' enthralling literary detective story The Quest for Corvo. I don't think there has ever been another book like it, and I think it is essential reading for all wannabe writers. Symons documents a literary obsession in a way that is hilarious, compelling and quite unique. In some ways he's a better author than Corvo ever was, but he only wrote one book of substance (this one), and it is so entirely convincing that most readers transfer their affection entirely to the book's subject, Baron Corvo. Corvo was a distinctly mad English Catholic, a disgraced priest who lived a singularly destructive lifestyle that described an almost perfect downward spiral. He died penniless and half-starved in Venice, where he lived on the streets and earned his living as a procurer of young men for wealthy British homosexuals on holiday. His journals describe his tortured and entirely insane expatriate existence, surviving on one stale bread-roll a day and seducing gondoliers at night. Baron Corvo (his title was highly suspect, by the way) wrote an eccentric masterpiece called Hadrian the Seventh, a neurotic revenge-fantasy in which a misunderstood English priest is, against all odds, declared the next Pope, and goes about restructuring the Holy City, the papacy and the Church. It is similar in many ways to Huysmans' A Rebours, or De Quincey at his best, and Corvo (real name Frederick Rolfe - he liked to shorten the Frederick to "Fr." so people might mistake him for a priest) had an impeccable eye for style and detail. The book is unique in that it lampoons, slanders and vilifies almost everyone that Corvo had ever met in his adult life, barely making any effort to disguise his victims. 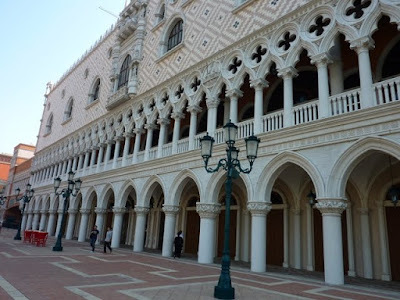 He also wrote a fascinating - though really peculiar - psycho-sexual love story set in Venice called The Desire and Pursuit of the Whole, a kind of dark version of Pygmalion which was again highly autobiographical, though the beloved object was morphed into a, much less scandalous, androgynous young girl. Corvo is another obvious object of literary cultishness - he was so even in the days when Symons wrote his book. His books are still quite obscure and difficult to get, though well worth the expense. Interestingly he was an associate of the Bensons, who I mentioned in my previous post. What's so attractive about Corvo is the great pathos of his life story. He lived and died for his art, performing quite self-consciously as "an author," writing in public in an enormous ledger with an immensely heavy silver pen. He was a born outcast, and was constitutionally incapable of getting along with anyone - his biography is a long list of obsession, conflict and rejection. He is a quixotic, romantic figure, not at all admirable, but so terrifically devoted to the idea of being a writer that he was willing to die for it. How can you not be inspired by someone like that? I have to admit that it was reading the letters of Nancy Mitford that made me aware of the novels of E. F. Benson. 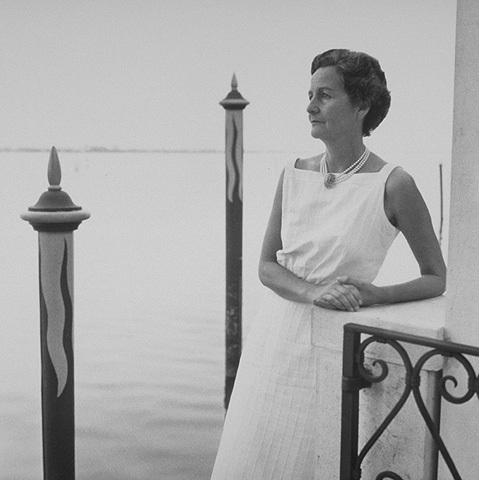 Mitford, Waugh, Lord Berners and many others among the Smart Young Things were in love with Benson's series of Lucia novels, though by then they were long out of print and difficult to get hold of. The socialites even went as far as to take out classified ads in magazines and newspapers saying "We will pay anything for Lucia novels." Mitford again and again claimed they were her favourite books, and she admitted they were a major influence on her own comic novels. When I started searching for E. F. Benson he was, once more, an obscure and largely forgotten figure. The novels were all out of print, but I managed to find in the library an old hardcover of Mapp & Lucia, and a love affair began. Benson is one of those writers who seems to attract a cult each generation, and I am happy to note that all of the Lucia novels are in print at the moment. But I still remember the fun of searching for second-hand copies of the books over a number of years, and occasionaly stumbling upon another Bensonophile, even, very rarely, the occasional person who'd gone to the great fuss and expense of joining the Benson Society in the UK. E. F. Benson was an Edwardian writer who came from one of those extraordinary families that could only ever emerge in England. His father had been Queen Victoria's Archbishop of Canterbury, and all of the Benson sons became writers of repute. 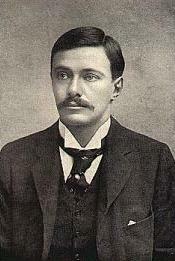 His older brother A. C. Benson was a bestselling diarist, whose yearly collections of essays and observations had an enormous audience in Edwardian England. His younger brother rather scandalously fell into the arms of the Roman Church, and became famous as Monsignor R. H. Benson, a prolific writer on matters Catholic (some of his ghastly devotional novels are still in print). What is really fascinating is that every single member of the family was homosexual (except the father), which must have made for very interesting family dinners. E. F. Benson's legendary Lucia novels are camp comic masterpieces, set among the overly-genteel but constantly impoverished upper-middle-classes in small-town Southern England. The heroine of the novels is the insufferable Lucia, a monstrously vain and pretentious middle-aged beauty who reigns as the queen of provincial society. Her nemesis is the plump and jealous Miss Mapp, a miserly and mean-spirited gossip who always fails to defeat the blithely abominbable Lucia. The other great character of the novels is Georgie, a prissy and difficult little queen who is mothered by the sundry widows and spinsters who populate Benson's world. Some have suggested that he is the first open and comfortable homosexual in the English novel, and I can't help but wonder if he isn't a version of Benson himself. The Lucia novels are laugh-out-loud funny, and in many ways terrifically modern. They are beautifully written and conceived, and as a chronicler of a particular moment in English history, Benson cannot be beaten. He also wote a number of memoirs and biographies, all of which are equally as beautifully written. Like his brothers, Benson was unstoppably prolific in his writing, and much of his other fiction (and yes, I do own almost all of it) is unreadable now. But the Lucia novels remain brilliant, and whenever I am feeling blue I know I can pick any of them up and lose myself instantly in their bizarrely complex and utterly charming worlds. 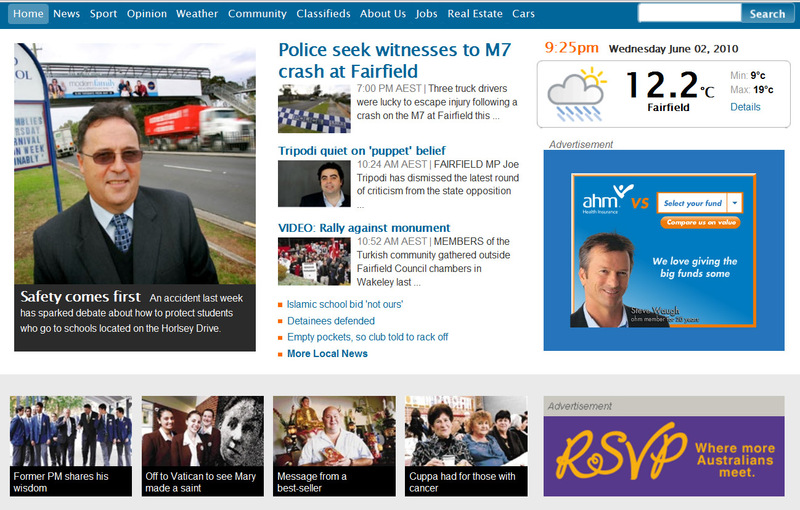 Listen to Walter's interview with ABC Radio Townsville breakfast announcer, Michael Clarke this week (Tue 15th June). Those who have been to my talks or my meditation classes would know that I have a thing for temple bells. 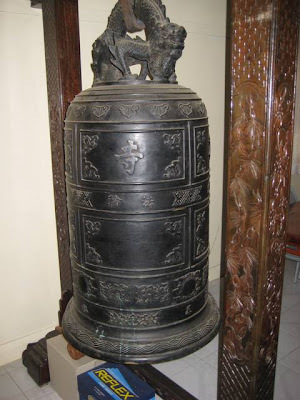 Indeed, there is a passage in Destination Saigon in which I talk about that most exquisite Vietnamese pasttime - listening to the afternoon bell in the temple garden. 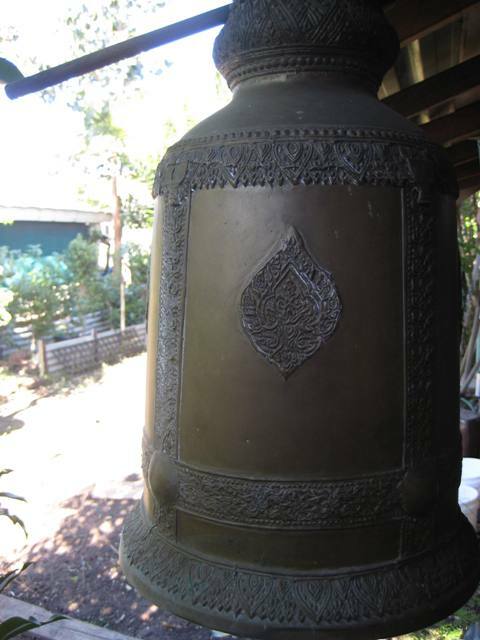 I thought I would document some of the bells in the temples in my neighbourhood. Unfortunately local councils in Australia are not so keen on the exquisite sound of the temple bell, and they are only allowed to be sounded at certain times - hence the stern note on this bell at Minh Quang temple. 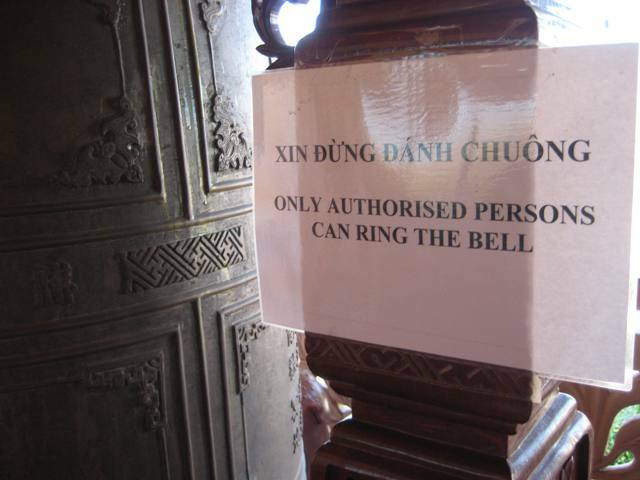 Thien An temple has an embarrassment of bells, it would seem. One stands forlornly in an ante-room of the main prayer hall, seemingly neglected. 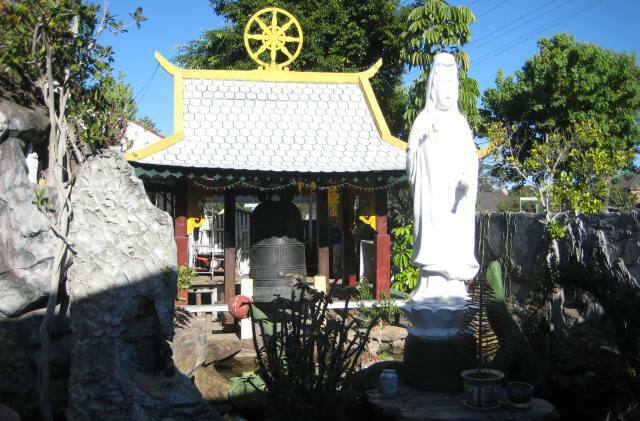 One has its own groovy little shelter in the temple garden. And there's even a miniature one attached to the eaves outside the kitchen. 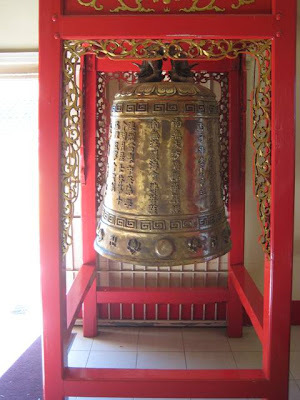 At the Mingyue Chinese temple there is a gorgeous specimen in the main prayer hall, suspended in its own custom-built red frame. I had a lovely time today conducting a writing workshop for the Liverpool Creative Writers. 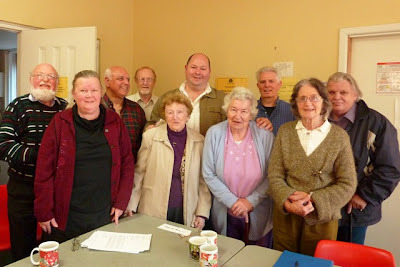 I have only just realised that this is the first writing workshop I have even conducted, and it was a great success. We explored ideas of travel and journey, and how we might be able to apply some of the techniques of travel writing to other forms and genres. As well as me talking we also did some practical exercises, at the end of which some of the group shared what they had written. They were a really terrific bunch of people, and we all had lots of fun. So much so that I've already been invited back! Walter's talk this Wednesday, 9th June was a fantastic success. Record crowds for Whitlam Library author talk event, record sales for the local Angus & Robertson bookshop. Thanks to Anne, Andrew and all at the Library for their wonderful help. 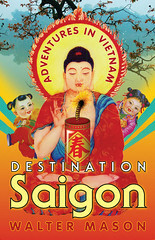 I have been really blown away by how many Vietnamese-Australians have contacted me praising Destination Saigon. It is unexpected and humbling. Even more humbling are the interviews I have conducted in Vietnamese! 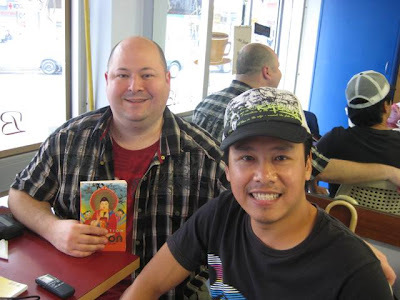 The debonair Quang Luu interviewed me for Voice of America's Vietnamese language program, but he was kind and did most of it in English, with me showing off occasionally in Viet. More gruelling was the long interview I did with SBS Radio's Vietnamese-language show. Fortunately it was pre-recorded, and the talented broadcaster edited it in such a way that I sounded fluent and clever. I am neither. Just last week I did an interview in Cabramatta with the handsome and charming Martin Le for 2GLF's Vietnamese language show. Martin was a little more brutal (and he speaks REALLY quickly), so I fear that I might come across as less-than articulate in the interview. In the end I fell on my sword and begged to answer the final questions in English - which he gallantly allowed me to do. 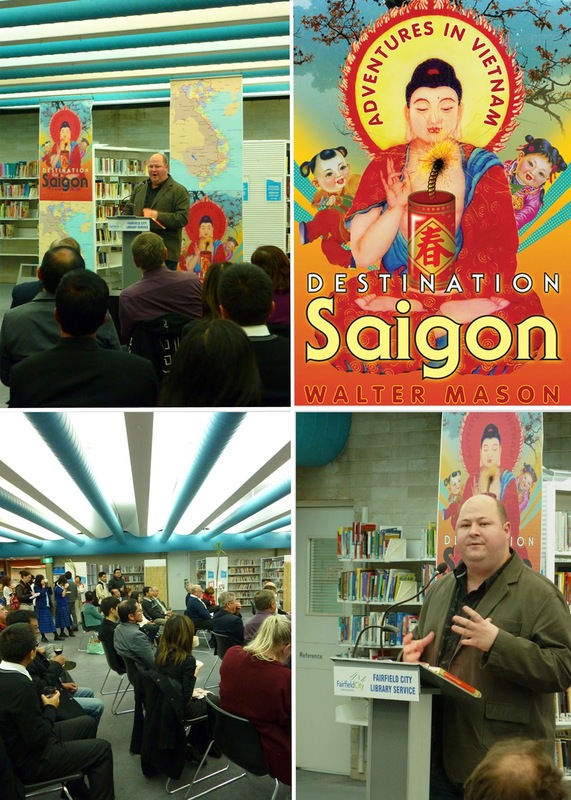 Walter will be speaking at Whitlam Library, Cabramatta on his travel experiences and on writing Destination Saigon. Thank you to Anne and Andrew at the council for their wonderful support, the posters look fantastic!! 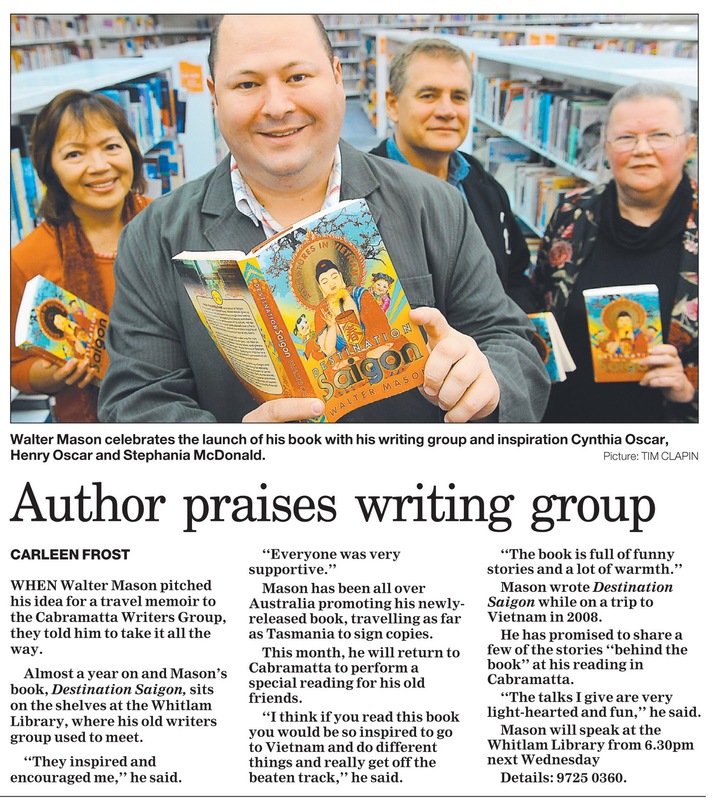 CANLEY Vale author Walter Mason has one message for aspiring writers in Fairfield and that is for them to pursue their own adventure. 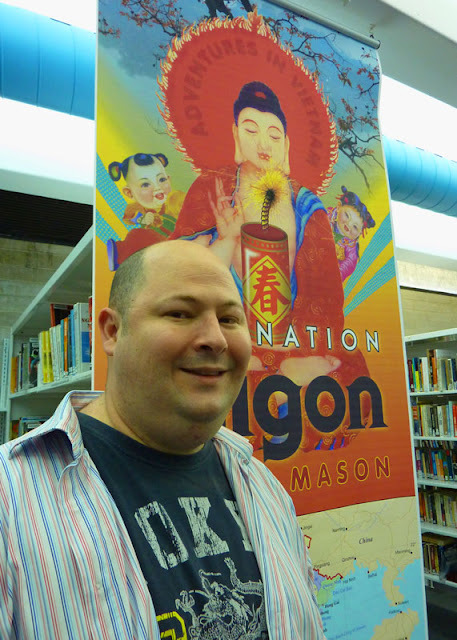 Hot of the heels of his runaway successful first novel Destination Saigon: Adventures in Vietnam Mason, 39, is in town to catch up with the literary community with a talk at the Whitlam Library in Cabramatta next Wednesday, June 9. 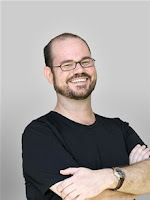 ``Hopefully, I can encourage people to pursue their own adventures and undertake their own journeys,'' said Mason, whose debut novel went into reprint on the first week of its release. 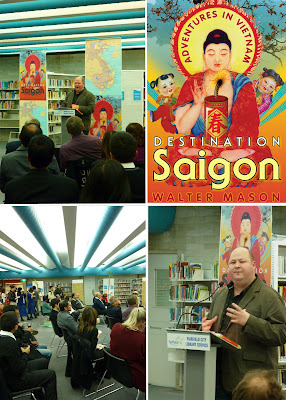 Mason will return to Vietnam in November to write his second travel adventure in Asia. 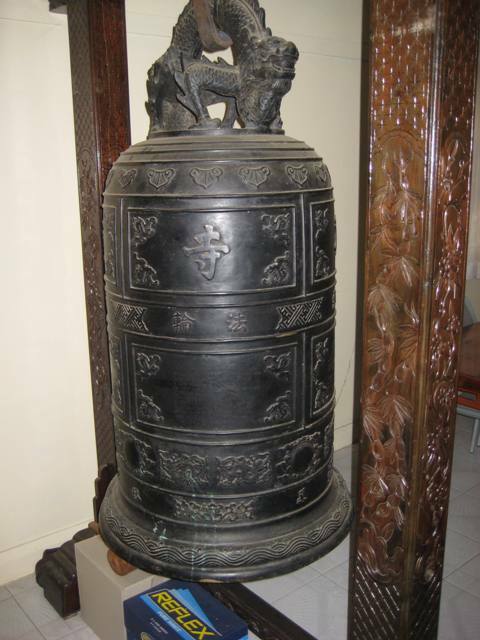 He said it would deal with themes of Buddhism, spirituality and personal connection. 1.You don't have to be perfect just write. Put pen to paper and don't worry about how wonderful it is. You can always fix it and change it later. 2. Read as much as you write. All writers read, and you especially need to stay up to date with writing in your own creative field. 3. Move in a writers' milieu. Find a writing group, even if it's online. Do writing courses, attend writers' festivals and listen to podcasts. 4. Find your niche.This is the modern variation of ``Write what you know''. The more you know about a subject, the better your writing will be. 5.Blog. Start writing and publish your writing online. It is free, it is easy, and it is amazing how many authors have been discovered this way. Walter Mason will give a talk at the Whitlam Library on Wednesday, June 9, at 6.30pm. He will holding a travel writing workshop at the Liverpool Writers' Festival.